If you’ve been to NYC you’ve seen the halal food carts that park on just about every street corner and serve up a variety of kabobs, gyros, rice concoctions, and mystery combo meals. You’ve also probably eaten at one of these. Fact 1: They are surprising delicious. Fact 2: You do not want to know what you are actually eating. On a mission to recreate the magic of a halal cart chicken kabob while also kicking it up a notch, I discovered the wonder inherent in yogurt marinade. You have got to try this. The yogurt, seasoned and spiced up, imbues the chicken with flavor, tenderizes the meat, and creates a delicious crust when grilled. Some of the delicious marinade is set aside and used as the base of a sauce that you can top your meat. Serve as I did on homemade flatbread with grilled vegetables or over rice. Trim excess fat from chicken and cut into bite-sized pieces. Slice red onion into large chunks. Slather in yogurt marinade, reserving about 1/3-1/2 cup. Cover in plastic wrap and refrigerate for 1-3 hours. Combine reserved marinade, dill, cucumber, and 1 cup yogurt in a serving bowl. Set aside. Allow extra marinade to drip off before grilling chicken skewers for 12-20 min on a hot grill or until cooked through. The edges of the chicken should be blacked and the center moist. 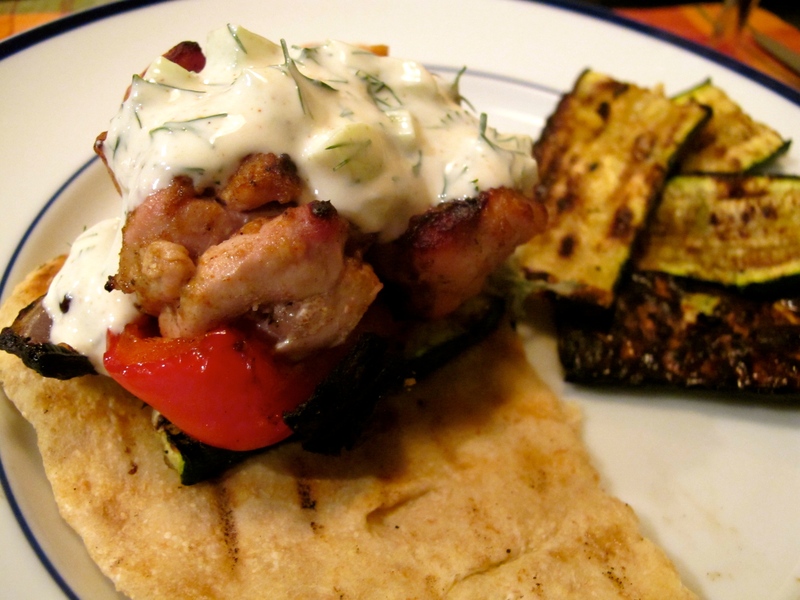 Serve on homemade or store bought pita with grilled vegetables. Top with the sauce you made earlier.